I’m not sure why, but lately I’ve been getting the urge to read books that are not what I typically reach for. Case in point: Kismet, a novel that decidedly fits into the romance category. I like romance in books, but I normally enjoy it more in the context of other generes (i.e. fantasy or historical fiction). 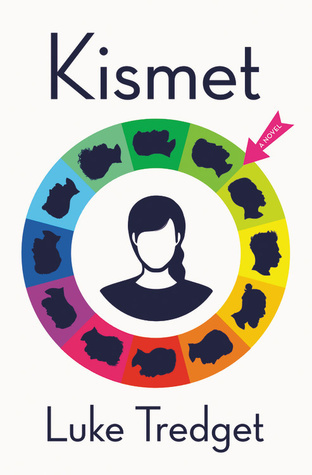 But Luke Tredget’s Kismet caught my eye first because it is described as “Black Mirror meets Bridget Jones“, both of which I love, and second, because the main character is my age and is neither hugely successful or married with kids, which is weirdly hard to find. So I thought this would be a fun summer read, and decided to pick it up. (From Goodreads) Black Mirror meets Bridget Jones in this whip-smart debut set in a world where the ultimate matchmaking app has redefined romance. Kismet was a really quick, interesting read. I liked how it explored online dating (something I’m terrified of), and it did remind me a bit of that Black Mirror episode with the social media. It definitely caught my attention and kept me reading to find out what happened. That said, there was a lot I didn’t love about this one. Everything in this book seems very unrealistic. Let’s leave the magic dating app aside, since it’s part of the fantasy. There are still so many problems. A student and a (junior) journalist can afford to buy their own flat (albeit a small one) in London? Okay, sure. And since when is £30,000 (about $39,000 USD) enough to pay a mortgage and all expenses for a year? In London, one of the most expensive cities in the world? Sorry, no. I don’t buy it. I make more than that and would probably vomit if I spent $320 on a pair of boots and can’t even afford a small apartment where I live, let alone half of a mortgage. I was so looking forward to reading a book with characters my age and in a similar situation, and I just couldn’t identify with this at all. It felt too unrealistic and it completely took me out of the story. Plus, the ending was completely unsatisfying. It could have redeemed some of the problems, but then it stopped short, which was kind of frustrating. ★★☆☆☆ – Sadly, Kismet was a two-star read for me. Two and a half if I’m being generous. It wasn’t terrible, but it was disappointing. This had the potential to be a good book, but it went down a different path instead. Throw in the annoying characters and complete disregard for reality, this was a miss for me. Kismet will be available in bookstores starting August 7. If you’re interested, you can preorder a copy on Amazon now.